One of my greatest pleasures as a journalist has been the ability to meet famous people and boyhood heroes throughout my career. In the 1970s, I traveled in Africa with famed anthropologists Louis and Mary Leakey, and also had the good fortune to have dinner with Haile Selassie, the Emperor of Ethiopia, in his Imperial Palace, in Addis Ababa. One boyhood hero whom I thought I would never meet was Sir Edmund Hillary, who was the first to scale Mt. Everest with Sherpa Tenzing Norgay in May, 1953. But 12 years ago, in serendipitous fashion, we wound up having lunch together and had quite some fun, too. 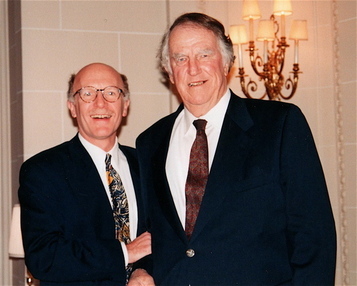 In 1996, I got to meet and have lunch with Sir Edmund Hillary. 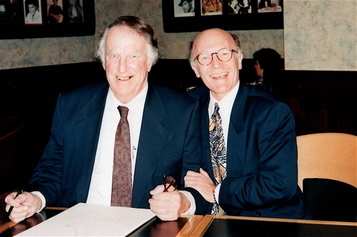 Sir Edmund Hillary came into my life in Toronto while I was Chairman of Fund-Raising Activities for UNICEF Canada. He was making one of his sweeps through North America for the UN Children’s Fund and stopped in Toronto for a day to meet UNICEF locals. We had lunch with a few of the highly dedicated UNICEF staff. Over soup and a sandwich, Sir Edmund admonished me for repeatedly sticking “Sir” in front of his name, and said, “Please, call me Ed.” Which, of course, turned the session into a much more relaxed, productive affair. 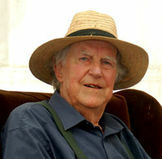 As it turns out, “Ed” died this week at the age of 88 in New Zealand, where he lived, and while this website is not about beekeepers or mountaineers, both of which Ed was, it IS about life, what constitutes a healthy one (wine and food, of course!) and the pleasures of the table, which is where I met Ed. Over lunch at Sutton Place Hotel, I asked Ed if he wouldn’t mind drawing something – to provide us with an autographed image that we could then auction at a forthcoming fund-raising event. Always chipper and agreeable, Ed said of course, so I ran down the block to Curry’s Art Store to purchase a large artist’s pad and some inky pens and then raced back to lunch. Ed drew a few simple lines and said “That’s me standing on the top of Everest,” and signed the drawing. 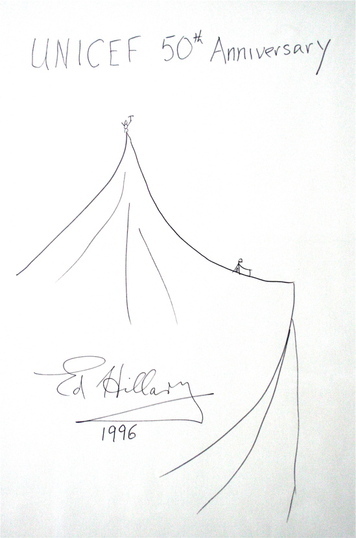 The image that Ed Hillary drew – that’s him on the tippy-top of Everest. We put Ed’s drawing up for auction at our annual fund-raising event where, I recall, we raised close to $125,000 in one night for UNICEF. Carol, my wife, knowing how much I revered my lunch with Sir Edmund, placed the tippy-top, Everest-like bid for the auctioned drawing, and won it! The rustic drawing (Ed was a better mountaineer than artist) has hung in my office ever since, a great souvenir of a great man who did a whole lot of great things for mankind as a dedicated philanthropist. During our time together, I got to ask Ed many questions. He answered all of them with a twinkle in his eye. He was affable, had no airs, no attitude, no ego. Oh that today’s celebrities were as down to Earth as Ed (an ironic expression to use for a guy who had been at the top of the Earth!). I had one other question, which led to a long, colorful reply. One of those stories which could only be told after the achievement and so honest. They do not make many like him big enough to be humble sorry to see him go. Wow great story hard to imagine the feat let alone back in the day! I love the story of Roger B too! One of those stories which could only be told after the achievement and so honest. They do not make many like him big enough to be humble sorry to see him go.